Posted byD Needlestone	 August 25, 2011 August 25, 2011 Leave a comment on Do Teens Use Twitter? While it may be the case that the majority of teens don’t tweet judging by today’s trends on Twitter in the UK they certainly have a strong presence. 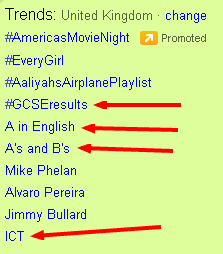 All the trending items with a red arrow annotated show topics related to GCSE examinations. These UK examinations are typically taken by 16 year olds. It may be that most teens don’t use twitter, it’s probably true that most people don’t use twitter, but of those that do teens certainly have the power to make their voices heard. Imagine what they could do if they clubbed together – the student voice could become quite powerful!